Toxic Alexandrium blooms in fish farming sites in Bolinao, Pangasinan. Journal of Environmental Science and Mangement, Special Issue 1: 44-49, 2013. Harmful algal blooms caused by proliferating dinoflagellates could pose danger to human health, bring about altered ecosystems, and / or result to marked economic losses. 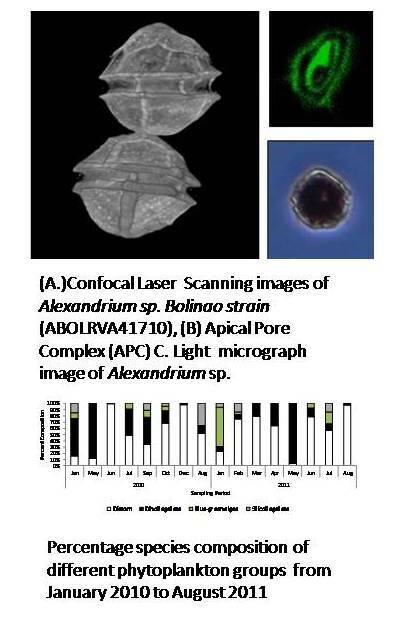 Alexandrium reported in fish farming sites of Bolinao, Pangasinan, are among these dinoflagellates known to cause Paralytic Shellfish Poisoning. A bloom of this organism has been documented over a two-year sampling program. The identity of this genus was confirmed by observing key morphological features of the genus under the Confocal Laser Scanning Microscope. Seasonal and spatial distribution has also been revealed where blooms of this organism peaked during the Trade winds (summer). The results of this study call for an intensive and extensive monitoring efforts especially before and during the Trade winds (summer) as prevent negative public impact. 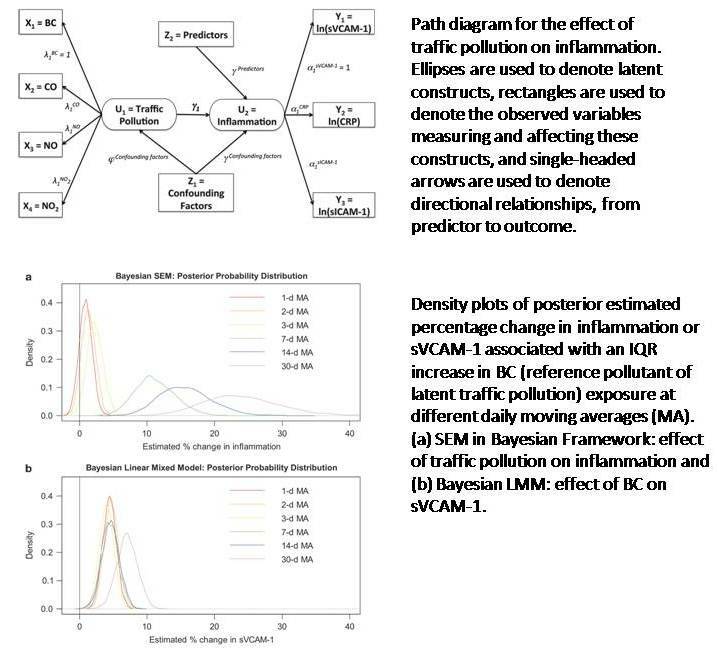 Structural equation modeling of the inflammatory response to traffic air pollution. Journal of Exposure Science and Environmental Epidemiology, 23: 268-274, December 2012. A new study from lead author Emmanuel S. Baja, research associate professor, University of the Philippines Manila and research fellow, Harvard School of Public Health, and co-authors adds to evidence that exposure to traffic air pollution adversely impacts inflammation in the elderly. The study appeared in the May/June 2013 issue of the Journal of Exposure Science and Environmental Epidemiology. 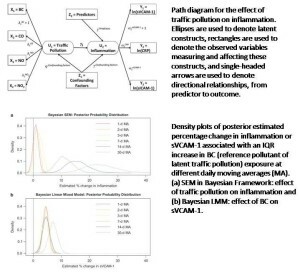 The research team looked at the effect of traffic pollution on inflammation using structural equation models (SEMs) in a Bayesian framework. The researchers analyzed traffic pollution data and markers of inflammation from January 2000 to December 2009 on 749 elderly men living in Greater Boston. The scientist found that traffic pollution was related to increased inflammation even after accounting for age, body mass index, smoking, alcohol consumption, medication usage, season, temperature and relative humidity. The study according to the researchers is the first to show simultaneous impacts of multiple traffic-related air pollutants on inflammation, a cardiovascular health outcome that has the ability to predict cardiovascular morbidity and mortality. As increased inflammation has been shown to predict cardiovascular disease among older men, the findings of Baja et al. suggest that traffic air pollution may adversely impact cardiovascular health through the inflammation pathway. The study population consists of a high proportion of ever-smoker older males who are predominately white and are mostly veterans that have special occupational exposure; the results may not be generalizable to younger individuals, women, never smokers or other racial and ethnic groups, additional studies should be conducted, the scientists said. Other co-authors include Joel D. Schwartz, professor of environmental epidemiology and environmental health, Harvard School of Public Health; Brent A. Coull, professor of biostatistics and environmental health, Harvard School of Public Health; Gregory A Wellenius, assistant professor of epidemiology, Brown University; Pantel S. Vokonas, professor of medicine and public health, Boston University; and Helen H. Suh, associate professor of health sciences, Northeastern University. Systematics of cryptic species of Lebinthus crickets in Mount Makiling (Grylloidea, Eneopterinae). Zootaxa, 3693(1): 049-063, July 2013. In the secondary forest of Mt. Makiling near the Forestry Campus of UP Los Baños, Philippines, researchers have found a mysterious species of ground dwelling crickets that was previously unknown to science. The new species, dubbed Lebinthus puyos, is a brown cricket and a rare species. These new species can be distinguished and differs from other Lebinthus found in the area by pattern of coloration including a whitish face and absence of orange band at apex of fastigium, and by male genitalia, which structures are closer to Lebinthus villemantae Robillard, 2010 from Sulawesi and Lebinthus truncatipennis Chopard, 1929 from Sumatra. Only a few specimens were discovered and collected in 2011 and none found in 2012 at the same location and living in sympatry with L. sanchezi and L. bitaeniatus. Ground dwelling crickets play a vital role in the forest ecosystems. The forest provide food for these crickets and in return crickets help in nutrient recycling and are good biological indicator of litter moisture of the forest.But these symbiotic relationships can be disrupted when their habitat and climate change. It was observed by the researchers that the population of this species is very low in ground leaf litters and restricted to a small patch in Mt. Makiling. They can also be found on top of leaves in small bushes. The discovery of this new species in Mt. Makiling confirms that there are 3 species of ground dwelling crickets in the area. Moreover, the newly discovered species revealed that there can be more species of crickets that can be found on this island nation. Climate change analysis of Lake Victoria outflows (Africa) using Soil and Water Assessment Tool (SWAT) and General Circulation Models (GCMs). Asia Life Sciences, 22(2): 659-675, 2013. The Soil and Water Assessment Tool (SWAT) program is used to build a hydrologic model of Lake Victoria in Africa. The impact of the climate change is then evaluated by changing the monthly rainfall and temperature in the SWAT, using four General Circulation Models (GCMs) acquired from the Intergovernmental Panel on Climate Change (IPCC) data center. The baseline period used is 1975-1982 and projections are made for two future periods: 2052-2059 and 2087-2094. From the results, each GCM gives different climatic projections, due to the uncertainties inherent in each GCM. Only one GCM projected a decrease in the lake outflow of about 6% (68 m3/s), while the other GCMs projected increases of up to 59% (720 m3/s). As such, the result should only serve as an estimate of the possible impact of climate changes on the outflows of the lake in view of future water resources management. Bacterial Diversity in the Saliva and Plaque of Caries-free and Caries-active Filipino Adults. 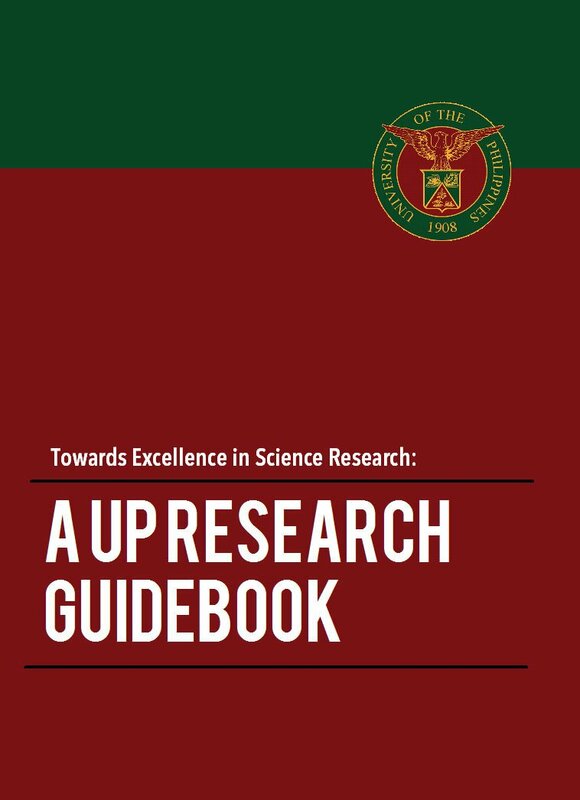 Philippine Journal of Science, 141(2): 217-227, December 2012. This research aims to know the different microbes in the mouth of Filipinos with and without tooth decay. The information from this research may aid in better understanding of dental caries among Filipinos and may help in identifying patients who are more at risk in developing dental caries. In addition, this study may also help in the development of a vaccine for dental caries in the future. Cenozoic Tectonics in the Buruanga Peninsula, Panay Island, Central Philippines, as Constrained by U–Pb, 40Ar/39Ar and Fission Track Thermochronometers. Tectonophysics, 582: 205-220, January 2013. Geodynamic Evolution of the Baguio Mineral District: Unlocking the Cenozoic Record From Clastic Rocks. Journal of Asian Earth Sciences (Special Issue: Gas/Fluid Geochemistry and Special Issue: Tectonics & Geohazards), 65:118–130, March 2013. The geological evolution of the Baguio Mineral District was constrained through the geology, petrography and geochemistry of the sedimentary rocks in the region. A change in the provenance of these rocks was noted from being quartz-rich during the Oligocene to quartz deficit in the Miocene. The Late Oligocene to Early Miocene Zigzag Formation was found to have probably been derived from the Cordon Syenite Complex/Palali Formation in the Northern Sierra Madre – Caraballo Mountains. In contrast, mafic rocks in an island arc setting is being inferred to be the source of the Middle to Late Miocene Klondyke, Late Miocene to Early Pliocene Amlang and Late Pliocene Cataguintingan Formation. 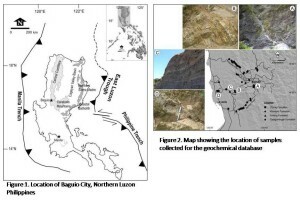 The insights from this study supplied significant clues from the sedimentary rocks in the region to the reconstruction of the tectonic history of the Baguio Mineral District. Thalassic Biogas Production From Sea Wrack Biomass Using Different Microbial Seeds: Cow Manure, Marine Sediment and Sea Wrack-Associated Microflora. Bioresource Technology, 133: 612-617, April 2013. Dislodged sea grasses and seaweeds on coastline were successfully degraded under high salinity (use of seawater as liquid substrate) conditions to produce biogas which could help island communities. The Potential Use of Legume-Based Diets Supplemented With Microbial Phytase on the Growth Performance and Feed Efficiency of Sea Bass, Lates calcarifer. 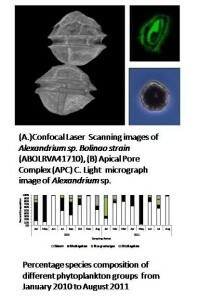 AACL Bioflux, 6(5): 453-463, September 2013. Results from the present study demonstrated that incorporation of microbial phytase at a level of 300 U Kg-1 diet in legume based diets did not improve the overall growth performance, bone mineralization and phosphorus utilization in sea bass juveniles. This may reflect that the dosage of 300 U microbial phytase from Aspergillus niger added to legume diets was insufficient for the optimal growth of seabass such as weight gain (%) specific growth rate and bioavailability of phosphorus for sea bass juveniles. Previous experiments have reported that dietary phytase supplementation have a negative effect on the growth performance for Japanese flounder, Paralichthys olivaceous and Korean rockfish, Sebastes schlegeli respectively fed diets containing soybean meal. On the contrary, weight gain was increased in the fed phytase supplemented diets as a result of improved use of phytate-P as well as phytate-bound protein as reported in channel catfish rainbow trout and in striped bass. DNA Barcoding Using Cytochrome Oxidase I (COI) of Pulmonate Gastropods from Batan Island, Batanes, Philippines. Asia Life Sciences, 22(2): 341-357, July-December 2013. 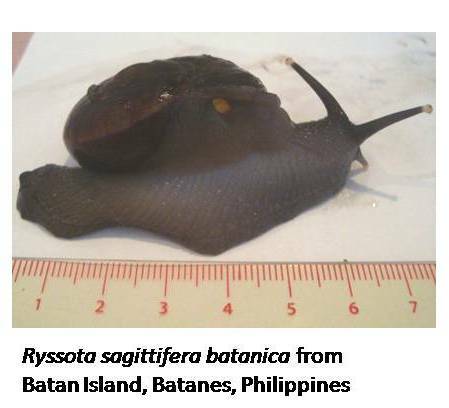 Barcoding snails and slugs from Batan Island, Batanes using DNA markers. DNA barcoding is a powerful tool that can potentially identify accurately and rapidly unknown individuals to known species. The technique involves obtaining the DNA from the specimen and sequencing a particular gene that can be compared with existing databases to find the identity or closest match. In animals, the cytochrome c oxidase subunit I (COI) gene is the marker of choice. In the Philippines, barcoding has focused primarily on fish, birds, and plants, with little emphasis on invertebrates. This study reports for the first time the COI sequences of air-breathing mollusks (pulmonates) collected from Batan Island, Batanes. Five species belonging to five different families were sequenced for the COI gene. These are Eulota mighelsiana (family Bradybaenidae), Ryssota sagittifera batanica (family Helicarionidae), Satsuma batanica (family Camaenidae), Trochomorpha troilus (family Trochomorphidae) and Sarasinula plebeia (family Veronicellidae). Of the five species, only S. batanica had a conspecific match (99.7% similarity) from with another individual of the same species in the GenBank database. The other four species did not show any match in the database and are therefore novel sequences. This study provides the initial batch of COI barcodes for the Philippine pulmonates and contributes to the DNA barcoding efforts of Philippine biodiversity. Development of Loop-Mediated Isothermal Amplification for Rapid Detection of Entamoeba histolytica. Asian Pacific Journal of Tropical Medicine, 6(6):457-461, June 2013. Objective: To develop a loop-mediated isothermal amplification (LAMP) assay for the detection of Entamoeba histolytica, the causative agent of amebiasis. Methods: The LAMP primer set was designed from E. histolytica hemolysin gene HLY6. Genomic DNA of E. histolytica trophozoites strain HK9 was used to optimize the LAMP mixture and conditions. Amplification of DNA in the LAMP mixture was monitored through visual inspection for turbidity of the LAMP mix as well as addition of fluorescent dye. Results: Positive LAMP reactions turned turbid while negative ones remained clear. Upon addition of a fluorescent dye, all positive reactions turned green while the negative control remained orange under ambient light. After elecrophoresis in 1.5% agarose gels, a ladder of multiple bands of different sizes can be observed in positive samples while no bands were detected in the negative control. The sensitivity of the assay was found to be 5 parasites per reaction which corresponds to approximately 15.8 ng/µl DNA. The specificity of the assay was verified by the absence of amplified products when DNA from other gastrointestinal parasites such as the morphologically similar but non-pathogenic species, E. dispar, and other diarrhea-causing organisms such as Blastocystis hominis and Escherichia coli were used. Conclusion: The LAMP assay we have developed enabled the detection of Entamoeba histolytica with rapidity and ease, therefore rendering it suitable for laboratory and field diagnosis of amebiasis. Process Quality and Collaboration Quality on B2B e-Commerce. Industrial Management & Data Systems, 113(6): 908-926, 2013. Purpose – The purpose of this study is to propose two additions to the existing IS success model to influence usefulness and satisfaction, and ultimately customer loyalty. This study posits that process quality and collaboration quality will significantly influence perceptions on satisfaction, since both considerations are expected to improve interactions between the organization and its customers. Design/methodology/approach – The developed research model was tested in the context of B2B e-commerce users, employing structural equation modelling-partial least square to analyze and test the research hypotheses. Findings – Results show that adding process and collaboration quality to the model affects the way system, information, and service quality influences usefulness and satisfaction, suggesting a shift in perspectives and priorities when it comes to B2B e-commerce transactions. Furthermore, results show that process and collaboration quality have significant effects on usefulness and satisfaction, reinforcing the objective of using B2B e-commerce systems across supply chain members. Practical implications – This highlights the importance of improving business processes and enhancing collaboration activities, implying that managers should focus their efforts into enhancing customer service on top of system functionalities and features via B2B to better work with their supply chain partners. However, this study is limited in the context of a Taiwanese supply chain, suggesting that further research consider its applicability in different contexts, culturally and geographically, especially given the fact that B2B e-commerce enables cross-border business operations. Originality/value – This study also extends the IS success model, especially in the context of B2B e-commerce, by emphasizing behavioural considerations on top of the functional issues present in any information systems. Mechanical attributes of Gigantochloa levis and Dendrocalamus asper as Affected by the Appilication of Organic Fertilizer. Journal of Bamboo and Rattan, 10 (1-2): 5-18, 2011. 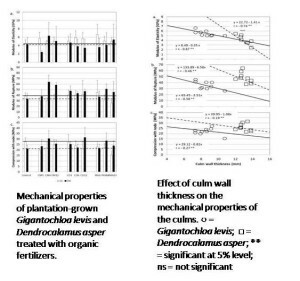 The mechanical properties of plantation-grown Gigantochloa levis and Dendrocalamus asper, were minimally affected by the application of Chicken Manure, Cow Dung and Rice Hull Ash. Culm thickness and specific gravity played an important role in the MOE, MOR and MCS of the culms. 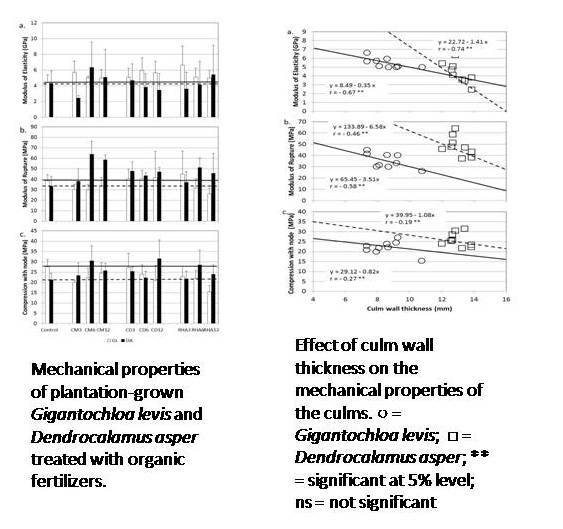 Wall thickness negatively influenced culm strength while specific gravity was positively correlated to it. Bamboo strength was not sensitive to fertilizer application. Bamboo growers can apply cheap organic fertilizers on their bamboo plantations for it would definitely improve plant survival and shoot production without sacrificing the mechanical properties of its culm. Growth and Survival in Soil and Effectiveness of Plant Growth Promoting Bacteria in Lettuce (Lactuca sativa L.) Grown in Varying Soil Types. Philippine Journal of Crop Science, 37 (2): 1-7, August 2012. One of the constraints to the adoption of plant growth promoting bacteria (PGPB) technology is the lack of information on crop response to PGPB inoculation in different soils. This study examined the effectiveness of PGPB inoculation on yield, shoot and root dry weight, nitrogen (N) and phosphorus (P) uptake of lettuce variety Green Tower grown in soils with contrasting chemical properties; Lipa clay loam (OM 4.7; pH 6.7), Luisiana clay (OM 2.8; pH 4.5) and Binangonan clay (OM 5.7; pH 7.9) under screenhouse condition. PGPB inoculation was combined with 3 fertilizer rates; zero, half-fertilizer recommendation and full-fertilizer recommendation based on soil analysis. In general, PGPB inoculation improved yield of lettuce grown in the 3 soils, although the level of improvement differred with increases ranging from 111% to 261%. The highest yield increase was obtained from lettuce grown in Binangonan clay while the lowest yield increase was from lettuce grown in Luisiana soil. Furthermore, the level of yield increase was higher in PGPB + zero fertilizer than PGPB + half-fertilizer rate or PGPB+ full-fertilizer rate, regardless of soil type. However, PGPB + full-fertilizer rate significantly improved the N content and N uptake of lettuce, regardless of soil type. PGPB inoculation combined with zero and full-fertilizer applications significantly enhanced plant’s P content and P uptake, an indication of P solubilising activity of PGPB inoculant used. In terms of soil survival and rhizosphere competence, PGPB inoculant in Luisiana clay performed poorly compared to its performance in Binangonan clay and Lipa clay loam. Polymerase Chain Reaction (PCR)-Based Cloning of Partial cDNAs of Selected Genes in Normal and Mutant ‘Macapuno’ Endosperms of Coconut (Cocos nucifera L.). Philippine Agricultural Scientist, 96(1): 7-17, March 2013. Makapuno is a mutant coconut (Cocos nucifera L.) with over-proliferating endosperm, occurring in the Philippines and Dutch East Indies. The science behind the makapuno phenomenon has not been completely understood. To determine the molecular basis of the makapuno phenomenon, a total of thirteen partial complementary DNA (cDNA) sequences were cloned. There is an absence of cDNA sequence variation between normal and mutant makapuno coconut. Inheritance and Expression of cry1Ac Gene in Bt Eggplant Backcroos Populations in the Philippines. Philippine Journal of Crop Science, 37(3): 1-9, December 2012. Through a public-private partnership, UPLB through the Institute of Plant Breeding – Crop Science Cluster is developing a fruit and shoot-borer (FSB) resistant eggplant through Bacillus thuringiensis (Bt) technology-aided conventional breeding methods. This is done to strengthen the country’s eggplant production by hoping to make available FSB resistant varieties, and lessen the environmental impacts and production costs for using chemical control for this crop’s most economically important local insect pest. The stable inheritance and expression of Bt cry1Ac was demonstrated in backcrosses of Philippine varieties with the Bt gene-donor parent MAHYCO event ‘EE-1’. Three successive F1 generations and one F2 generation of backcross-derived lines of transgenic eggplant of local cultivars Mara and Dumaguete long purple and ‘EE-1’ were used in a study to evaluate stability of cry1Ac gene transmission. Cry1Ac protein expression in developmental stages and in different plant parts were evaluated using BC2F1 and BC3F1 lines, respectively. Results showed that the cry1Ac gene in Philippine eggplant behaves as a single dominant gene that is stably passed on across generations of transgenic eggplant. In addition, Cry1Ac protein is expressed throughout the growth stages and different plant parts of backcross-derived lines of Bt-positive transgenic eggplant. Cry1Ac protein concentration was high to moderate in terminal leaves, flowers and fruit which are the entry points of EFSB larvae. Results imply a promise of effective pest control. The results of this study were used to further research and development of Bt eggplant cultivars, including environmental and food safety studies and insect resistance management. 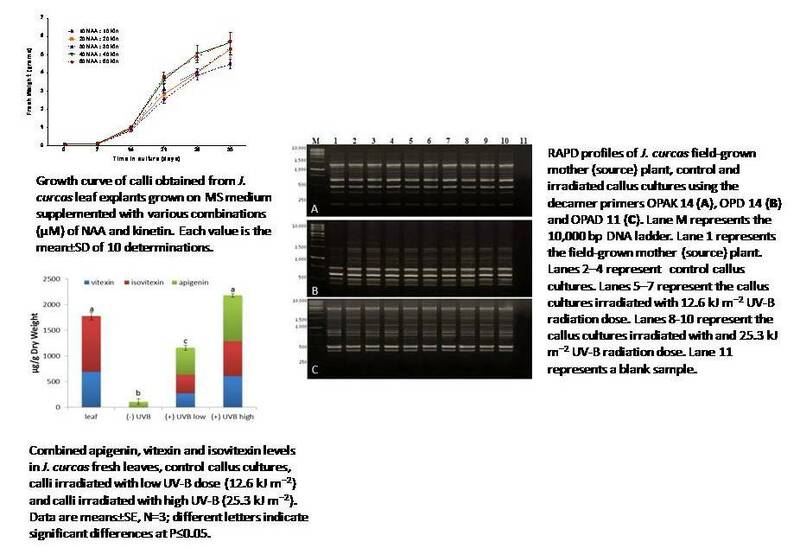 Ultraviolet-B (UV-B) Radiation as an Elicitor of Flavonoid Production in Callus Culture of Jatropa (Jatropha curcas L.). Philippine Agricultural Scientist, 95(4): 335-343, December 2012. Elicitation is the induced or enhanced biosynthesis of metabolites due to the action of elicitors. An elicitor is a substance or a condition which, when introduced in small quantities to a living cell system, initiates or improves biosynthesis of specific compounds. As an abiotic elicitor in plants, UV-B radiation has been shown to enhance production of UV-absorbing compounds such as flavonoids. 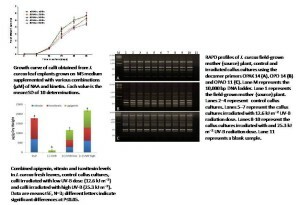 In this study, UV-B radiation was incorporated in the culture process to test its potential to increase production of flavonoids in tissue cultures of “tuba-tuba” (Jatropha curcas) which, after undergoing dedifferentiation, have lost the capacity to synthesize the compounds normally produced in developed organs. Callus tissues were obtained by inducing cell division on wounded leaf portions of J. curcas using media supplemented with plant hormones. The amorphous masses of cells produced were exposed to two doses of fluorescent light-emitted UV-B radiation and the levels of the flavonoid compounds in the treated calli were analyzed and compared with those found in whole leaves and untreated cultures. Results showed that UV-B irradiation resulted to a considerable increase in the production of flavonoids in the irradiated calli. Moreover, analyses of DNA extracts from the treated and untreated cultures revealed that UV-B irradiation did not bring about any alterations in DNA sequence supporting the notion that UV-induced synthesis of flavonoids results from increased expression of genes involved in flavonoid production. This study would serve as an initial step in the production of cell lines and whole plants with increased flavonoid synthesis. Collection Action and Adaptive Capacity of Communities During Disasters : The Case of Oil Spill in Guimaras, Philippines. Journal of Environmental Science and Management, 15(1): 6-16, June 2012. Under conditions of limited time, resources, and attention, appraisal of responses to threats of industrialpollution presents formidable challenges for governance and disaster preparedness. A community’s socialdynamics could very well explain how the responses to such perturbations are made and what inherent traits ofthe household/community make them adaptive to disasters. Using both qualitative and quantitative approaches inresearch, this study looked at the collective action and adaptive capacity of communities affected by an oil spill. 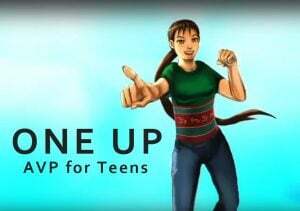 Questionnaire was fielded out to elicit data on communities’ quantitative level of adaptive capacity and focusgroup discussions, in-depth interviews, observations, and narrative analysis were employed for qualitative data. The oil spill experience reveals three forms of collectivity: actions through formal organizations, informalorganizations and spontaneous actions — all anchored on residents’ varying motives, and intentions. 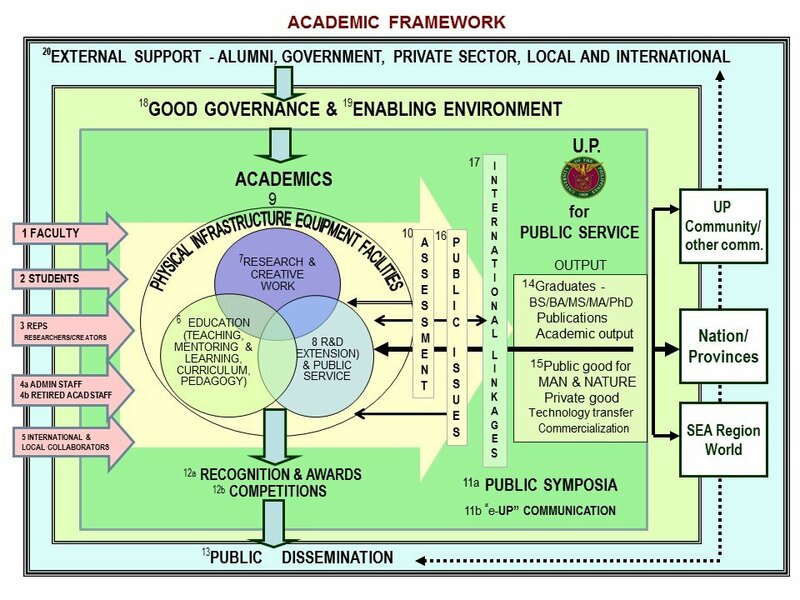 Collective actionwhen harnessed by personal agency results into desired trajectories thus strengthening communities’ adaptive capacity. A household adaptive capacity index (HACI) consisting of demographic structure, economic well-being,interconnectivity to higher level processes, and dependence on a resource– as indicator of measuring adaptive capacitywas devised and employed in selected communities affected by oil spill in Guimaras, Philippines. Ten percent or 88households were randomly selected as survey respondents. In the outcome, the communities were fairly adaptable(with HACI of 55.43) to the perturbations. It was concluded that a strong social capital, high economic well-being, andless dependence on a single resource for livelihood made the household highly adaptable to environmental stresses. Insecticidal Activity of Crude Plant Extracts Against Sitophilus spp. (Coleoptera: Curculionidae) and Callosobruchus chinensis (L.) (Coleoptera: Bruchidae). 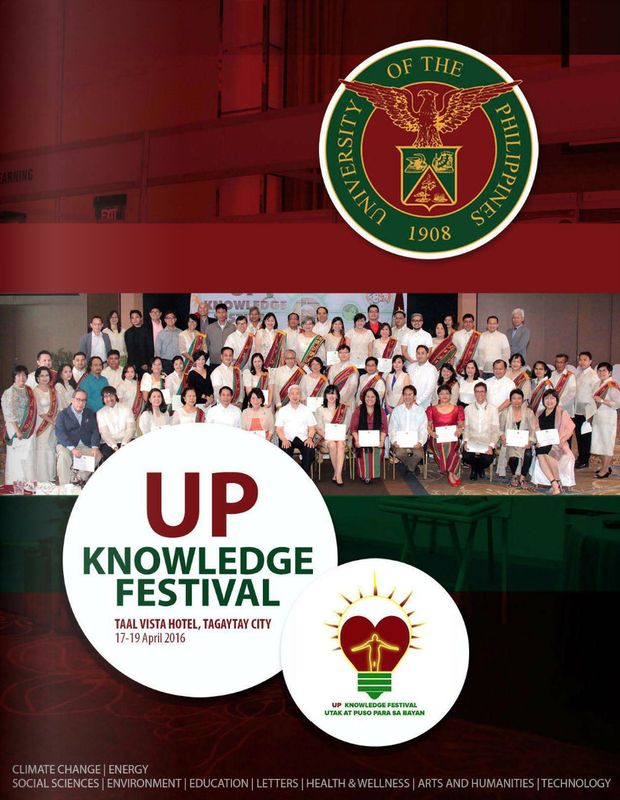 Philippine Agricultural Scientist, 96 (2): 154-162, June 2013. The maize weevil complex, Sitophilus spp. is a serious pest of corn, cereal grains, and cereal products while the bean beetle, Callosobruchus chinensis is a serious pest of stored beans. Losses due to these storage insect pests could reach as high as 80 to 100% within three months if left uncontrolled. Management of insect pests in many storage systems rely primarily on misting residual spray and fumigation. The increased public concern over the residual toxicity of insecticides applied to stored product insect pests and the necessary precautions to work with traditional chemical insecticides call for alternatives that are ecologically sound with no residual activity and adverse effects on other non-target organism. In this regard, many plant products including botanical insecticides have been evaluated for their insecticidal properties against different stored grain pests. The deleterious effects of crude plant extracts on storage insect pests are manifested in several ways including toxicity, growth retardation, feeding inhibition, oviposition deterrence, repellence and fumigant action. With these properties, crude extracts could be a good alternative to replace the highly persistent chemical insecticides for the management of stored grain insect pests. The crude extracts from three plant species (citronella, Cymbopogon nardus; langkauas, Alpinia pyramidata; and patchouli, Pogostemon cablin) were extracted using acetone. The repellent activity and contact toxicity of the crude extracts were evaluated against the adult maize weevil, Sitophilus spp., and the bean beetle, Callosobruchus chinensis. 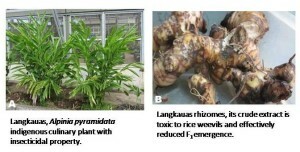 Citronella crude extract provided the highest repellency against maize weevil but langkauas provided 100% oviposition deterrence and reduction in F1 emergence None of the three crude extracts showed contact toxicity against maize weevil, but langkauas crude extract is the most toxic (LD50 = 0.085) against bean beetle at 48h exposure. The crude extract with the highest biological activity was selected and formulated as emulsifiable concentrate (EC) and evaluated for admixture grain treatment application. The grain admixed with formulated langkauas crude extracts at 7.5% (w/w) provided 100% reduction in F1 emergence in maize weevil. Similarly, the admixture treatment of 2% langkauas crude extract in mung bean caused 100% mortality in C. chinensis in 5 days and provided 95% reduction in F1 emergence. The insecticidal activity of langkauas crude extract was enhanced against maize weevil and bean beetle when formulated and applied as EC. Bean beetle was more sensitive to the three crude extracts compared with maize weevil. Langkauas crude extract proved to be the most effective against maize weevil and bean beetle, providing the highest reduction in F1 emergence both as repellent and as admixture grain treatment. Additionally, it had the highest contact toxicity as shown by the lowest LD50 values. REDD Policy Impacts on Indegenous Property Rights Regimes on Palawan Island, the Philippines. Human Ecology, 40(5): 679-691, October 2012. Several Southeast Asian states have been working feverishly to design and implement REDD policy frameworks to fulfil their commitment to global climate change mitigation. In doing so, state agencies will be challenged to design REDD plus policies that value and conserve forest carbon in ways that align with national policies and local priorities for managing forest landscapes defined by complex property rights regimes. However, as with other market-based policies, the expeditious delivery of REDD could bypass critical analysis of potential interactions with national tenure regimes, customary property rights, and local livelihoods. Drawing on the case of Palawan Island—a forested frontier island in the Philippines—we examine how nascent REDD policies can articulate with state sanctioned tenure, customary tenure, and forest uses in changing livelihood contexts. This paper draws on research among Tagbanua and Pala’wan people to illustrate how complex and changing tenure structures, commodity markets and livelihood dynamics may influence how REDD plus interventions affect indigenous customary lands and forest use. We argue that the ability of indigenous forest users tomaintain stored carbon and improve livelihoods is contingent upon the ‘socio-material’ form of carbon—a commodity defined in relation to the resources and social processes of which it is part.